The use of new technologies has not only helped further investigation of the Puig Ciutat site in the digitisation, management, analysis and interpretation of the field data, but also to publicise it. In this respect, 3D technology offers the chance to present interactive models of archaeological elements and sites that simplify the transmission of complex scientific content and results. For this reason, the main object of this section is to present 3D models of the items retrieved over several archaeological seasons. 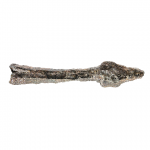 The presence of the two hooks is definite proof that the inhabitants of Puig Ciutat used to fish in the rivers. Although remains of fish have not yet been documented, fishing activity is also documented by the discovery of a possible lead weight from a fishing net. 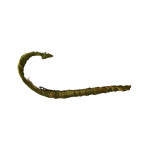 Bronze hooks are known since the 8th century BC and this type of item has varied very little in the course of time, those used today still being very similar. Although certain variations in size and design can be made out, especially in the method for attaching the line, for the moment it has not been studied much and with current knowledge this isn’t possible. Fishing by hook is probably the method most used for catching fish in the rivers, and they have been located in several Ibero-Roman sites and in the Celtiberian city of Numancia. The widespread use of this type of arms can be explained both by their ease of transport –they are small and can be carried in large quantities– and by their effectiveness when fired from long distances. Another advantage they have is that, unlike arrows, their path is invisible and the enemy has more difficulty protecting himself. The range of this weapon varies and depends both on the length of the sling and the weight of the projectiles. However, it’s reckoned that the sling’s maximum range was around 100 metres (300 ft) when it comes to military effectiveness. This light, easily manufactured weapon could do a lot of damage both in the open, where it would have been used as a long-range weapon, and in sieges, where it would be used both by defenders and attackers. Dimensions: 6 x 4 cm. Thickness: 1 cm. This type of object was used in medicine and cosmetics and has been documented since the 3rd millennium BC in Egypt and in the Cyclades. Although some are known from the Roman Republican Period, they were more abundant in the Imperial Period, when they became an essential object in the Hispano-Roman domestic sphere and throughout the empire. It’s also thought they might have been used for work with precious metals since Greek times and even earlier, like the one found in Choisy-au-Bac (Oise) north of Paris, which has been dated to the Late Bronze or Early Iron Age. They would have been used as practical tools for determining the purity of a piece of gold or silver. In our case, we think that, judging from the point where the item was located, in a space where it seems metal was worked, it would have been used as a touchstone for working with precious metals. Dimensions: length (from the spikes to the outer part of the handle): 5 cm. length (from the spikes to the inner part of the handle): 4,7 cm. Irregular thickness (of the spikes): de 0,4 a 0,6 cm. Thickness (of the square handle): 0,7 x 1,2 cm. diametre of the ring: outer: 2,4 cm; inner: 1,5 cm. 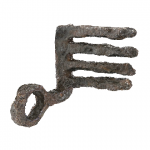 Description: Door key with four teeth, a short handle and a bow. Some of the teeth are slightly at an angle, which could have been caused in ancient times or due to the weight of the earth. The bow is large enough to carry it on one finger. At a nearby point in the same room, a lock plate was found which could have been related to it. 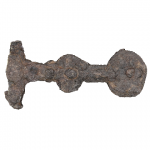 Similar lock plates have been found at the Camp de les Lloses site in Osona. Dimensions: total length: 10,3cm; length of the body:7,1cm; length of the head: 3,2 cm. irregular diametre of the body: from 1,8 cm at the openeing, to 1,1 cm where the head starts. Maximum width at the base of the head: 1,6 cm. Weight: 60gr. Description: Square-sectioned compact, solid pilum catapultarium bolt with socket attachment to the shaft. Catapult bolts could be a very effective weapon for eliminating the defenders of a wall in a hypothetical siege. The catapult was a weapon belonging to torsion artillery, which normally used ropes made from animal tendons and was built on a frame. 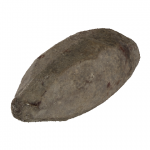 Its projectiles were made with a wooden shaft and a very sharp iron tip measuring between 7 and 11 cm. Catapults, like other artillery weapons, have their origin in the Greek world, where they were used from the beginning of the 4th century BC. According to written sources, the catapult was introduced to the Roman legions from the 3rd century BC on, and some authors believe it was Julius Caesar who first permanently equipped his army with small catapults. The tips of these projectiles could pierce metal sheets up to 1.5 cm thick, so that cuirasses and shields were now insufficient protection against this type of weapon. Description: Hilt of a bidiscoidal dagger still with the rivets that joined the two parts together. The blade has been lost. Using X-rays, it has been possible to see that the dagger had bronze decorations in the areas close to the rivets on the discs. In some cases, this weapon has been considered of Hispanic origin, with many examples in the Celtiberian area. However, isolated examples are also known that come from Iberian territory, like the one located at Turó del Vent (Llinars del Vallès). It seems that some examples of this type of weapon are found in contexts from the end of the 4th century BC, though they become more abundant from the 3rd century BC in the indigenous world. In Roman contexts, daggers (pugio) have been documented in 1st-century military contexts in La Caridad (Teruel) and Cáceres el Viejo (Cáceres). They must be seen as a purchase or plunder and were used from time to time by officials and legionaries. It was therefore an additional weapon, probably more important in day-to-day life than in battle. The item found in Puig Ciutat must be associated with this sort of context. Production: black burnish from Cales. Description: Large black glazed plate or dish from Cales. This is an important item of tableware and is of some value. They are considered luxury products imitating the gold, silver or bronze tableware that not everyone could afford. 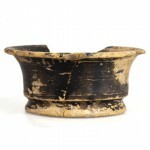 This type of ceramics goes back to black glazed Greek and Etruscan productions. 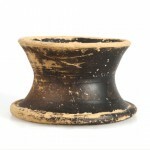 Unlike its forerunners, Roman black glazed ceramics aren’t brush painted but literally submerged in a clay solution. Once the item has been fired for the second time the typical black glaze of these ceramics appears. 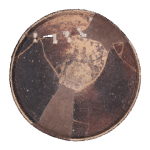 In this case, it’s a plate or dish with a vertical lip and a moulded annular foot. It has incised decoration of concentric circles on the internal background. It’s worth noting that the repair with staples speaks for its intrinsic value and the difficulty involved in replacing it. This type of artefact was used for presenting and serving food and for consuming solids, and was for either individual or collective use. 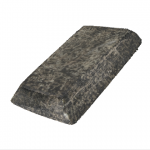 Dimensions: maximum length: 18,5 cm; width: 2,7 cm; thickness: 0,4cm. Very often they had a blade for pruning on one side and a machete blade on the other to help cut through thicker stems. Description: A small pyx with tapered edge and concave sides without a rim and with an annular foot. It has no decoration. For individual use for consuming liquids. The black glazed table ceramics must be associated with the Roman presence, first the army and later merchants and the Italian population, who adapted to changes in fashion faster than the natives. In this respect, study of this type of import is fundamental for attributing dates to the sites where they appear. The fact that the objects changed according to fashion and needs means we have been able to create a typological catalogue of these objects, listed at 25-year intervals in most cases. Name of the object: small goblet or cup. Dimensions: height: 4 cm. diametre: 9,7 cm. Description: Small goblet or tapering cup with concave sides and a marked inflection at the bottom. It shows no decoration. For individual use for consuming liquids. 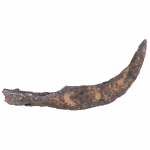 This item was imported from the Italian Peninsula and is closely tied to the Roman army, which was the first link between the natives of the Iberian Peninsula and Rome. In this respect, the widespread use of imported fine ceramics must be associated with the Roman presence in the territory, first the army and later the Roman or Italian population that settled in the east and interior of the Iberian Peninsula. Remember that in Augustus’s time the fashion for fine ceramics changed, going from the black ceramics typical of the previous period to the red of the famous terra sigillatta, of which there are no examples at Puig Ciutat.